These were THE chip brand in Southern California. It was only a few years ago that many of the popular brands were local. 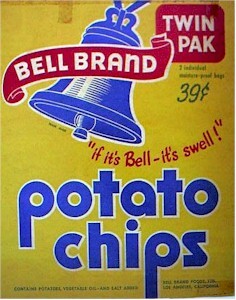 We called them Bell Brand potato chips. The slogan was, "If it's Bell, it's swell." Mattel toys used the same slogan; it wasn't unusual to see Mattel and Bell Brand commercials, one after the other on local TV shows. I only remember these as the potato chip brand you found in a candy machine. Never sold by itself on a counter or supermarket like Wise or Lay's.